For our February newsletter I decided to highlight Chinese face reading for couples in a relationship as well as singles looking for a relationship. During the Chinese dynasties one of the primary functions of Chinese face reading was matchmaking. This not only meant romantic matches but included all interpersonal relations such as those within a work group, siblings, parent/child, or friends and business associates. The ancient art of Chinese face reading reveals personality traits one may have, type of work ethic one has, it can determine communication styles as well as identify where personalities match or clash. Readings I have done for couples in the past have been well received. It is a unique activity to do together plus it allows greater understanding between partners. Areas commonly addressed are lifestyle, how to better communicate and education about the of five elemental personalities to gain perspective on how they react to each other. One couple that came in for a face reading gained greater insight into a longstanding household argument. He felt that she always nagged him about putting his clothes away and she felt that he shouldn’t be treating her like his mother, left to clean up after him. When analyzing their faces it was revealed that she was a metal type and he was a earth type. So as a metal type she needs open organized space and tidiness to be happy and clearheaded; whereas, as an earth type he is more comfortable in “lived-in” informal surroundings and his focus is on loving warm interactions rather than environmental details. He never realized that a tidy living space was essential to her comfort and he was particularly sensitive to her nagging as an attempt to control or express disapproval when in fact she merely needed a clean room in order to relax. They left happy in this discovery and it became less of an issue once they realized the natures of their personalities. This is definitely not couple’s counseling or a replacement for professional marital help but I have had couples state that the face reading session was much more productive, enlightening and helpful than years of marriage counseling because they finally felt like they understood each other. We offer gift certificates for single, couple or group readings (lonely hearts clubs welcome). Call 804-501-8060 today for more information or click here to purchase a gift certificate online. Contact us today for a Chinese Face Reading! Contact us today for a consult! We can help you with your natural fertility enhancement program. Decide to do acupuncture this year. Are you feeing run down, depressed, anxious? Are chronic health conditions dragging down your enjoyment of life? Do you want to get pregnant this year? Would your life be easier if your hormones were more balanced? Is your stress slowly killing you? Acupuncture can help with all these issues as well as general wellbeing. If you are interested in maintaining wellness acupuncture is a powerful preventative medicine to help maintain your wellness. Not sure acupuncture is for you? We have complimentary consultations so just ask! Don’t give your friends and loved ones more stuff-give them the unique gift of acupuncture or a Chinese Face Reading. Or let them choose their preferred service with a gift certificate in any denomination. We offer acupuncture, herbal and food therapy sessions, Chinese face readings, energy work and classes in all the above. Mystery illnesses or disorders of unknown etiology notorious for leaving one feeling confused, hopeless, helpless and depressed. Often those suffering from mystery illnesses undergo a barrage of tests, evaluations and seek out doctors in many different specialities in the hopes of finding a diagnosis. The technical difficulties of diagnosis are many in allopathic medicine which tends to take a few symptoms and compares them to known diseases in order to form a diagnosis There are a myriad of tests, which have results to interpret, as well as all the different factors and presentations of the endless number of diseases. Diagnosis is one of the strengths of Chinese medicine, without a correct and proper diagnosis there is no plan of action to help the body heal. Correct diagnosis is also important to prevent further damage to the patient, improve mental emotional state and quick recovery by immediate treatment implementation. In Chinese medicine, diagnostics are actually very logical, low tech and easy to understand which is beneficial to determining the cause of mystery illnesses. The ancient Chinese were astute observers. It is by observation of the body, its signals and close analysis of symptoms that a Chinese practitioner comes to a diagnosis. In my practice I use face reading and five element theory to diagnose my patients presenting with disorders of unknown etiology or mystery illnesses. The face is an incredibly accurate map of your health, barometer of the health of different organs, and a the reliable readout of body functions or dysfunctions. Eventually a pattern of imbalance emerges with analysis of a patient’s face and tongue along with a thorough intake detailing all symptoms, emotions, lifestyle and medical history. There is a finite number of patterns of illness in Chinese medicine along with a corresponding proven method of correcting those imbalances via acupuncture, herbs, food therapy and lifestyle changes. It is within this paradigm that Chinese medicine excels in providing a Chinese diagnosis for that which is considered a mystery illness in allopathic medicine. Not only is Chinese medicine able to extrapolate a diagnosis but it is also able to determine the root cause of the disease. Mystery illnesses can be remedied and at times resolved by determining the root cause of one’s disease symptoms that are affecting the body. For example, in a particular Chinese diagnostic pattern insomnia, reflux, rashes and headaches can all be part of the same pattern, therefore; implementing the solution to that pattern disharmony results in eventual improvement of all those aforementioned symptoms. Additional advantages to Chinese diagnostic theory is its the ability to hone in on which organ system may be weak or malfunctioning in order to give allopathic medicine a more precise area to examine. In the case of one of my patients who had abdominal bloating, skin discoloration, fatigue, fevers and a general sense of malaise Chinese diagnostics were able to determine that there was something dysfunctional in the upper right quadrant of his small intestine having to do with some type of toxicity. When examined closer a polyp was found in that length of the intestine as well as an underlying severe allergy to three foods common in his daily diet. The Chinese diagnosis led his doctor to do allergy testing and take a closer look at his intestines to come up with some solution to a problem that was previously categorized as a mystery illness. Please contact us today, so we can lead you down a path to better health! Join us at our Bellevue office for our Holiday Market. Health is the greatest gift and we have gift certificates for it! Give your friends and family less "stuff" - give them unique experiences, relaxation and wellness. Meet our practitioners and learn more about their therapies and myriad of health benefits. Pick up some gift certificates for face reading, acupuncture, food therapy sessions, herbal consults, personal yoga, Reiki and Qi Gong sessions. Meet our Energy Medicine Center practitioners, ask about 2019 classes, sessions and services. Remee Gemo, L.Ac. will be available to discuss Chinese Face reading and Acupuncture, Shirlea Pemberton of Forestree Farmacy will share herbal knowledge and provide tincture tastings, Joy Black will introduce you to the ancient art of Qi Gong and there will be Reiki practitioners onsite to discuss the benefits of energy work. Hope to see you there! Friends and family are welcome! Chinese Medicine is a combination of Chinese modalities that can help the detoxify the body, improve fertility, alleviate stress and addresses most major health imbalances across many systems. Chinese Medicine uses acupuncture which is the gentle insertion of tiny needles into acupuncture points. This chinese medicine method is one of the better known modalities. It is very effective in treating physical ailments, mental emotional disorders, infertility, hormones and digestion. In Chinese Medicine we also employ Chinese herbals. These are different from herbals sold in pharmacies or vitamin shops in that they are personalized to each patient’s unique set of symptoms and disease pattern. They are combinations fo herbs that have been used for thousands of years, empirically tested formulas that improve organ and hormone function, benefit the digestion, immune system and hormonal system. They are prescribed by your acupuncturist who is also a Chinese herbalist and as your health improves your combination of herbs is altered to get you to the next level of health. Eastern food therapy is a very healing and much needed branch of Chinese medicine. In a time where the quality of food is in question and digestive and metabolic disorders run rampant guidance in time tested food therapy is life changing. In Chinese Medicine food is seen as curative medicine when used properly, but used in excess or improperly it is also the cause of many diseases and imbalances. In Chinese medicine food therapy food is “prescribed” according to the individual’s specific array of symptoms and imbalances. Each person is different and their energetic and physical health needs are different so your acupuncturist will design a protocol specific to you. Chinese face reading is a diagnostic method that sets Chinese medicine apart. There are only a handful of practitioners of Chinese medicine that utilize this intricate method in the United States. The face is a micro system of the entire body. Each body system’s health or malfunction can be decerned from facial features, lines, blemishes, discolorations and complexion. Face reading can also see where there may be stuck emotional energy, undiscovered talents and personality traits. Chinese medicine is a fascinating, effective, natural method of healing that has existed for thousands of years. If you would like to experience a treatment or have a specific need that may be remedied by Chinese medicine please contact us or make an appointment at the link below. Empress Elixir tea is a magnificent organic herbal tea blend that benefits, restores balance and supports women’s health. This tea can be taken hot or cold. Empress Elixir has a lovely flavor slightly sweet, fresh, and lightly herbaceous. It contains no caffeine so it can be used as a relaxing evening cup of tea. Each ingredient has a myriad of health benefits. Empress Elixir herbal tea is a powerful wellness combination that should be a staple in your diet. To brew a cup of Empress Elixir Tea Pour 8-12 oz of boiling water over 1 teaspoon of tea. Steep for 3-4 minutes or to desired strength. Our Tea Therapy teas are high quality, organic and flavorful. A teaspoon of Empress Elixir can be resteeped up to 4 times depending on desired flavor- so don’t toss out your herbal tea re-use it or store in in the fridge to re-steep the next day. Decades of healing work and clinical observation has allowed me to create system of therapy with a strong base in the energetic theory, five elemental philosophy with exceptional if not amazing clinical results. Remee Energy Medicine and Intuition system of therapies (R.E.M.I. system) is unique a 5 branched system of healing. The five branches consist of energy work, nature based remedies, acupuncture meridian therapy, intuitive diagnostics, and face reading. The energy work branch is a mixture of Reiki, Chinese yin yang theory, and chakra therapy. Energy can be influenced by the physical, mental or spiritual aspects of our being. Often I find at he core of disease emotions are the basis of many physical ailments. The nature based remedies include plant or herbal therapies, medicinal tea, aromatherapy and meditation. These are modalities that help by supporting the physical body systems and boosting available energy for healing. The acupuncture meridian therapy branch relates to use of acupressure, esoteric acupuncture and acupoint stimulation methods. This ancient system has a myriad of applications, I like to teach my patients how to utilize points that can best serve the maintenance of their emotional and physical well-being. The intuitive diagnostic branch is utilized to diagnose the energetic imbalances, evaluate auric disturbances, identify areas of disease or blockage and determine best treatment methods to apply. Medical Intuition, auric scanning, and Chakra balancing are a few of the methods used. The last branch consists of facial reading which can diagnose imbalance, show energetic flow or blockage, identify important life patterns and discover a person's life path and where adherence or avoidance of that path has caused disharmony. These methods are highly effective, gentle and life changing. Everyone can benefit from this therapy but it is most often used for those that are seeking the next level of well-being that expands into the the spiritual and emotional realms. It is gentle enough to be applied to children, those that are acupuncture needle-averse, those that are severely ill, as well as those suffering from illnesses of unknown etiology aka "mystery illnesses", and is particularly useful in emotional or energy based disorders. R.E.M.I. energy work sessions are very relaxing, grounding and balancing. Depending on the type of imbalance a person is seeking to remedy one may need multiple visits. Visits are typically 1 hour long. Contact us via phone, email or text to set up your treatment. To learn more about becoming a R.E.M.I. system practitioner please contact us below at our sister site Energy Medicine Center. Or check for upcoming R.E.M.I. classes on our calendar (private classes can also be requested). 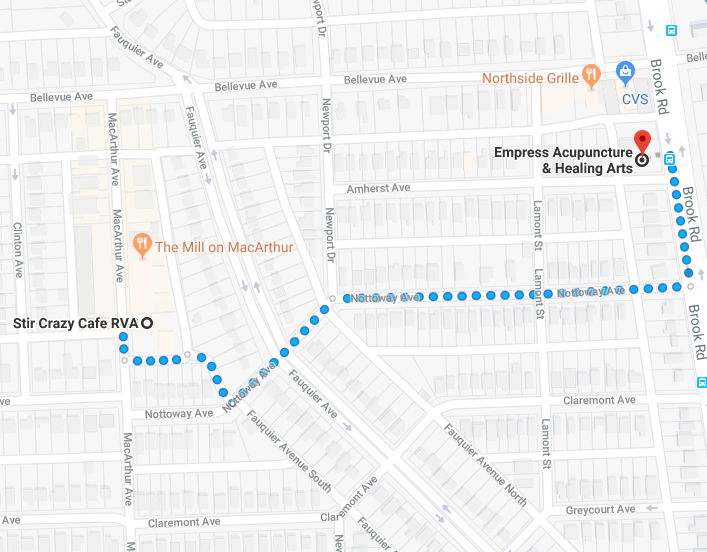 Today we sat down with Remee Gemo of Empress Acupuncture in Richmond, Virginia, to ask her some questions about what services she provides and why she specializes in fertility acupuncture. >What drew you you to working with women’s health? I love a challenge and women’s health was a natural fit for my skill set as it is the most complicated arena of Chinese Medicine specialty with a strong basis in science. I have degrees and training in the Sciences, Biology and Psychology which transfer well into understanding the details of women’s hormonal fluctuations, bloodwork values, physiological processes and emotional needs. I also saw a need in the area for a women’s healing center that offered acupuncture for women from a woman. >What types of issues do you treat? I treat any type of women’s health disorders including hormone, fertility, menstrual, menopausal and emotional problems. I do acupuncture for pregnancy maintenance, post partum healing and overall maintaining balanced health. Additionally, I enjoy the detail work and fine needling skills needed to do Acupuncture Facelifts and treat Bells Palsy. >What are your favorite successes? I love seeing people’s faces change as treatments progress. I am also trained as a Chinese facial diagnostician and the changes that I see in someone’s face with acupuncture still amaze me. Over time I see their faces have fewer and fewer signs of imbalance in the face, less depression more shine in the eyes and more “Qi” or life force showing that they are becoming balanced and are healing. Also I love getting Christmas cards every year with pictures of all the "acupuncture-babies" that were helped by acupuncture. What would your advice be to a prospective patient? Be open to believing in your body’s powerful healing ability. The acupuncture enhances, encourages and gives a boost to your body’s natural healing mechanism. Also take responsibility for the excess stress and bad food choices that may have made it easier for disease to take a hold. Part of maintaining health is reading your body’s distress signals and taking action to change what causes imbalance and disease. If you are interested in a consult with Remee please contact us today. Thank you for voting Empress Acupuncture and Healing Arts one of Richmond’s Best Alternative Health Centers! Check us out in May’s Style Weekly’s “Best Of Richmond” edition! 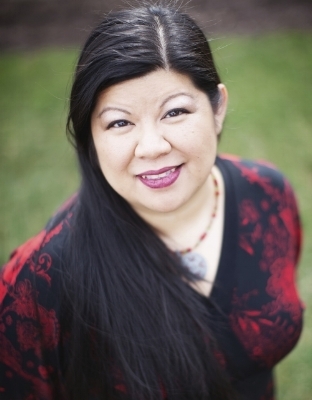 It’s been a pleasure serving Richmond, Midlothian and the surrounding areas in your women’s healthcare and fertility needs and I look forward to continuing the high standard of care and individualized attention for which Empress Acupuncture is known. I am grateful for all the time, support and consideration in referring your loved ones, friends and voting for Empress Acupuncture and Healing Arts as your favorite healing center. 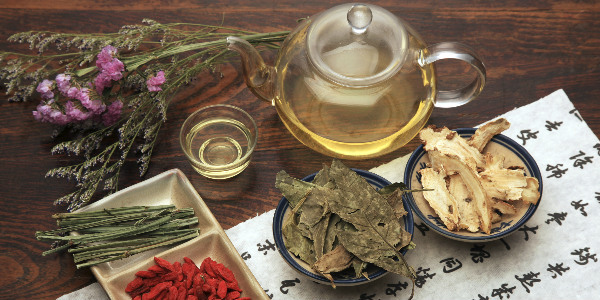 Chinese medicine can help fertility in women in a number of ways. Chinese medicine also known as Oriental Medicine improves fertility using several therapies. Chinese medicine consists of not just acupuncture but also encompasses Chinese herbal formulations, Tuina, Qigong, and Eastern dietary therapy. - Chinese medicine can help fertility in women via acupuncture by manipulating the functions of the body by using acupuncture meridians gently stimulated in areas correlating to hormone balance, reproductive vigor, metabolic functions and organ systems. - With Chinese herbal formulations you are supplementing the body with beneficial micronutrients and macronutrients that improve the body on a material level in a way that is safe, side effect free and lasting. - Using Tuina: Tuina is a Chinese style of bodywork that when applied to the abdomen or meridians related to reproduction can improve overall function of the reproductive organs, relax the tubules and ligaments of the lower abdomen and improve blood flow to the uterus and ovaries. - Chinese medicine can help fertility with Qigong by body movements that generate healing energy (Qi) encouraging the qi to flow freely, improve circulation and decrease stress. - With Eastern dietary therapy you are building the body with healing foods, eradicating deleterious foods and mitigating health imbalances with food as medicine. Find out what combination of Chinese Medicine modalities are appropriate for your individual case scheduling your complimentary 15 minute consult. Contact us today! When you come to Empress Acupuncture for an infertility acupuncture session we begin with a detailed history. We will not only go over your reproductive health but your general health as well. One of the strengths of Chinese medicine and acupuncture is that it is a holistic medicine that takes into account the how different systems interplay, what other aspects may be influencing your infertility and ways that your body can more efficiently come into a state of wellbeing. Acupuncture and Oriental medicine seek to address the root of the problem instead of addressing just the symptoms of a deeper imbalance. In this method of treating the root cause of your infertility you gain greater and more lasting improvement in your health. Once we have established your Chinese diagnosis via the interview and medical history I do a Chinese facial analysis, look at your tongue and occasionally a Chinese pulse diagnosis. Most acupuncturists will check tongue and pulse but I find that face reading is so accurate (to the degree that I can tell what quadrant of the uterus an embryo has implanted in) I tend to lean heavily on that diagnostic method. Being a master face reader sets my practice apart from others in that it is a quick, efficient and exact diagnostic method. Not all acupuncturists are trained in Chinese Facial Diagnosis as it requires an additional three years of study and apprenticeship to master and having earned the title of Master Chinese Physiognomist (face reader) I have found it an invaluable tool to help others with their healing. Afterwards we begin the acupuncture session in a relaxing, dimly lit room. For more details on the acupuncture session check out this blog. Detoxification is an important part of maintaining the body. Our world has progressively become more toxic, more unnatural and full of adaptation challenges for our bodies. Additionally, food is less nutritious, healthy eating is often a luxury in the fast paced 24/7 plugged in lifestyles of today. In Chinese Medicine it is understood that the body will naturally detoxify itself in the Spring from the heavy foods of winter and hibernation sluggishness. While in the in the fall the body naturally detoxifies to prepare for harsher weather and hold on to calories for warmth. The summer and winter are stressful seasons in regards to maintaining temperatures, activity and food sources so these seasons are discouraged as times to detoxify due to the added stress. The New Year’s resolution of starting a detox to clean up from the heavy, sugary, calorie dense celebratory foods of winter is done in good intent but is actually considered detrimental to the body. January is the middle of winter and still cold and the body tries to hold on to calories, so depriving it of food and forcing a purge is counterproductive. Also note that any type of diet/fast that severely weakens the body such as extreme calorie restriction or dependence on a single food/drink etc is also detrimental to a body. Such extreme detoxes are useful for profoundly robust young and excess types such as teenage males that are excessively yang but are only harmful to other types that need support to strengthen and not deplete the qi/life force of the body. This is a protocol that is subtle, effective and natural. You will not starve or feel weak. One can employ it in whole or in part as needed during the detoxification times of the year and some parts can be made part of daily life. The Acupuncture portion that is designed to accompany this program utilizes acupuncture points that encourage the various detoxification organs like the liver, kidneys, lungs intestines and skin to cleanse and balance themselves by releasing toxins, strengthening organ function and improving blood and lymph flow. Sign up for Empress Acupuncture's Spring Detoxification and Acupuncture program combining Eastern dietary therapy for cleansing the internal organs, lifestyle changes to encourage the body to release toxins, and for abdominal acupuncture treatments focusing on enhancing functions of the liver, kidneys, intestines and lungs over 2 week period. Sign up here or click the button below! I truly enjoy being an acupuncturist, herbalist and healer at Empress Acupuncture, if you have enjoyed or benefitted from sessions with me please vote Empress Acupuncture into Style Weekly's "Best of Richmond " under Best Alternative Health Services. I would appreciate it immensely! Simply click the link or button below. Then enter Empress Acupuncture into the Best Alternative Health Services field, put in your email address and click submit! Thats it! Alison wanted to share her story and how acupuncture treatments helped her fertility and pregnancy. For more information please contact us today! Thanks Alison! We are so happy for you! Acupuncture is of great benefit to fertility. There are many ways in which one can increase their chances of conception by using acupuncture and chinese herbs to address a wide range of fertility problems. Fertility Acupuncture can treat fertility problems related to thyroid. Hypothyroid and hyperthyroid create challenges to fertility that acupuncture can remedy helping balance thyroid function. Fertility acupuncture can also improve ovarian function and follicular function by increasing blood flow to the ovaries and lower abdomen ensuring proper nutrients are delivered to the ovaries. This increased blood flow to the abdomen also benefits fertility in that the endometrium builds up and thickens so that the environment is ripe for implantation. Polycystic Ovarian syndrome or PCOS is another fertility problem that is helped immensely by acupuncture. Fertility can be improved and in some cases restored when women suffering from PCOS utilize acupuncture to manage stress, hormones and metabolism; these are the three aspects of this disorder according to Chinese medicine that block fertility and require balance. Other problems that may block fertility successfully treated by acupuncture is luteal phase defect and follicle stimulating hormones FSH balance. Acupuncture harmonizes the hormones to improve your fertility and aids in the proper timing of hormonal cycling. Acupuncture treats not only women’s fertility problems, but male factor fertility problems also can be improved with acupuncture. In cases where infertility is unexplained, fertility acupuncture works by balancing the body and reproduction with Chinese diagnostics, chinese herbal formulations and acupuncture to boost fertility. Fertility enhancement acupuncture is safe, effective and it has been used for thousands of years. Set up a consultation to have your questions answered by an acupuncture fertility specialist by clicking the buttons below! Thank you for your refill submission! Please pick up your refill at one of our locations. Curious about acupuncture? Want to decipher your wrinkles? Ever done Qi Gong? What natural herbals will keep your digestion in line? Wonder what your dog is thinking? 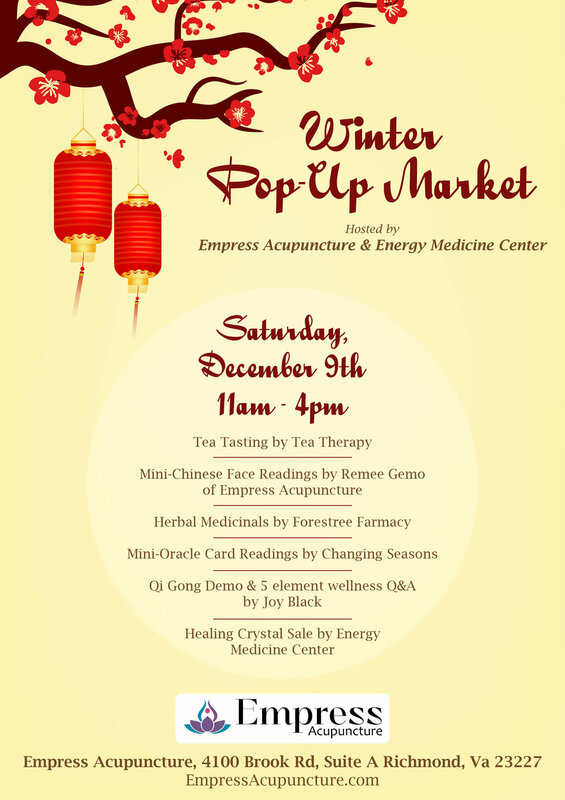 The Winter Pop Up market at Empress Acupuncture is a unique opportunity to answer all the above questions and learn more about the ancient art of face reading, healing with herbs, Chinese medicine, Qi Gong, acupuncture, energy work and animal Reiki. We will have professionals in all the above modalities to answer questions and introduce you to their craft. There will also be complimentary tea tasting, mini-face reading sessions, Qi Gong demos, herbal consults and card readings. Vendors of crystals, teas and stocking stuffers will be available for your shopping pleasure and we of course will have gift baskets and gift certificates for Chinese Face Readings, acupuncture, Reiki, crystal therapy, herbal consults and Qi Gong for sale. The Energy Medicine Center and Empress Acupuncture is located in the Susan Cunningham office park near the corner of Bellevue and Brook. Look for our banners! Come see us! Topical CBD ointment is exceptional in treating inflammation, pain and achiness in muscles joints and tendons. It is all-natural made with camphor, menthol and the Charlotte's Web cannabidiol extract which is the best hemp extract in the world. The THC component has been stripped from the oil leaving the highest amount of CBD which provides the greatest ability to heal. This topical ointment is able to penetrate very deeply into the area of pain, soreness and inflammation. It helps to speed blood circulation in the local area, alleviate swelling and inflammation as well as relieving pain and discomfort. Half ounce containers are available to make the product affordable, plus a little goes a long way. Stop by our offices and alleviate your pain by picking some up today! Acupuncture increases chances of conception in many ways. One method is by improving chances of implantation by relaxing the muscles, ligaments and tubules in the reproductive organs. There is an improvement in blood flow in blood flow which in turn thickens and nourishes the uterine lining, balances hormones and the body's hormone response. Another way acupuncture improves chances of conception is by reducing stress. Stress has been shown to be a negative influence on fertility by increasing cortisol in the body which throws off your body's hormones, metabolism and sleep cycles. Acupuncture is beneficial to the chances of conception because it improves overall well being by increasing the body's efficient use of energy, improves the efficient function of various organ systems, helps boost the immune system and is beneficial to sound sleep. All these advantages to acupuncture increase your chances of conception so give us a call at 804-501-8060 or use our online scheduling to set up your appointment.